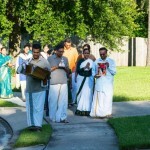 A three-day discourse series was delivered by Sri.Poornimaji in Houston from June5-7th 2015. 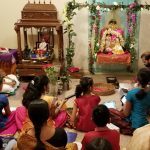 She gave a wonderful, brief talk on Nama Mahima, the power of the Divine Name on Friday, June 5th 2015 at the residence of Smt. 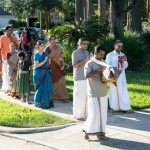 Selvi and Sri Ram Samy. 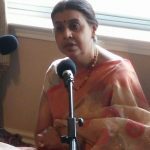 She elucidated on the greatness of God’s Name through the deep verses of Sri Swamiji’s beautiful Mahamantra Song – “Kaliyaiyum bali kollum”, and through the experiences and stories of various devotees. 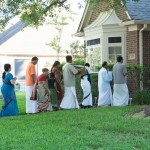 About 30 people attended the satsang. 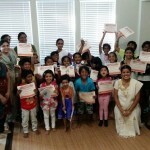 On Saturday, June 6th 2015, Gopa Kuteeram children and their parents presented a teacher appreciation event where all the children dressed up as different characters from our scriptures and also made Thank you cards for their Gopa Kuteeram teachers. 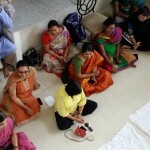 The satsang was held at the residence of Smt. 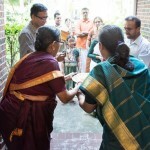 Malathi and Sri Ravi. Following this, Sri.Poornimaji spoke very inspiringly to the parents and others who were assembled, on the importance of devotion in childhood through the story of Prahlada. 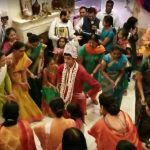 After the talk, the children, who had meanwhile practiced a play on Prahlada, presented the play to their parents and were applauded for the effort. 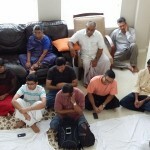 Sri.Poornimaji spoke on the story of King Bali and Lord Vamana on Sunday, June 7th 2015 at the residence of Smt. Saraswathy and Sri Muthu Raman. 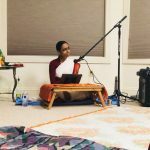 She beautifully spoke about the greatness of King Bali right from his first interaction with Lord Sri Hari during the Amrutha Mathanam episode, his Guru bhakti, his devotion to the Lord, and his final surrender of his ego to Bhagavan. 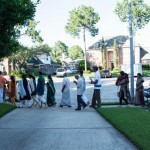 Following this satsang, all the assembled devotees performed a short Nagara sankirtan around their street and neighborhood, chanting the Mahamantra for the welfare of everyone.